Banks Peninsula and the Port Hills – soil loss and the erosion and sediment control tools required. Erosion of soils from poorly protected land results in pollution of waterways and coasts. Erosion is the process where soil particles are detached from the surface and transported, either overland, in water or in the air. Erosion happens when the erosive forces of wind, raindrop impact or flowing water are greater than the cohesive forces within the soil. Dislodged soil particles are then able to be moved by those forces, downslope, along water currents and through the air. 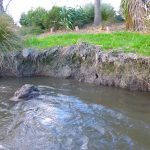 Sedimentation is the process where eroded soil particles are deposited, either on the bed of waterway or lake, a floodplain (which can vary from a very small flat area next to a stream, up to the Canterbury plains). Airborne soil particles are deposited when the air velocity is no longer sufficient to keep them suspended. They may be re-suspended by other strong winds. Likewise in waterways or coasts, sediment will be deposited on the bed or land when the water is still enough for particles to settle. Once mobilised, many Canterbury soils are difficult to retain on site. Many have chemical or physical characteristics which make them hard to retain without the use of the tools in this toolbox. 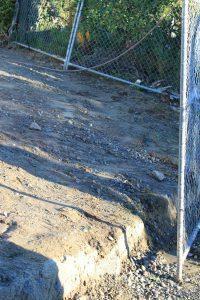 Here are commonly observed types of erosion in Canterbury. Preventing erosion is better than remediation, which can be very difficult and costly for large scale soil loss. When a raindrop hits an exposed soil surface, the soil aggregates are broken up and individual particles are displaced both vertically and horizontally. If erosion occurs on a slope, gravity will cause these particles to move downslope. The potential for soil disturbance is increased during heavy rainfall due to higher rainfall intensity. Splash erosion makes soil particles more vulnerable to erosion by runoff and increases the amount of sediment available to transport by runoff. Splash erosion at the head of a cut, loess soil on a building site on Lyttelton Harbour/Whakaraupō. Close-up of surface showing splash erosion effects. Sheet erosion is the uniform removal of soil in thin layers caused by rainfall impact and overland flow spread across the land surface. It occurs when rainfall intensity exceeds the infiltration rate of a soil and the capacity of available surface detention. It can cover large areas of sloping land and can go unnoticed for some time. If not remediated, it has the potential to gradually remove the nutrients and organic matter and result in loss of productivity on slopes and elevated sediment concentrations in receiving waters. Rill erosion is the removal of soil by runoff moving in concentrated flows along channels. 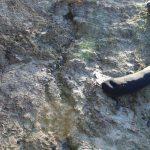 Rill erosion occurs when uniform sheet flows are broken up into more concentrated flow paths. The channelisation of the flow leads to greater energy flow which is able to detach and transport larger amounts of sediment. Rill erosion forming on a short steep track. 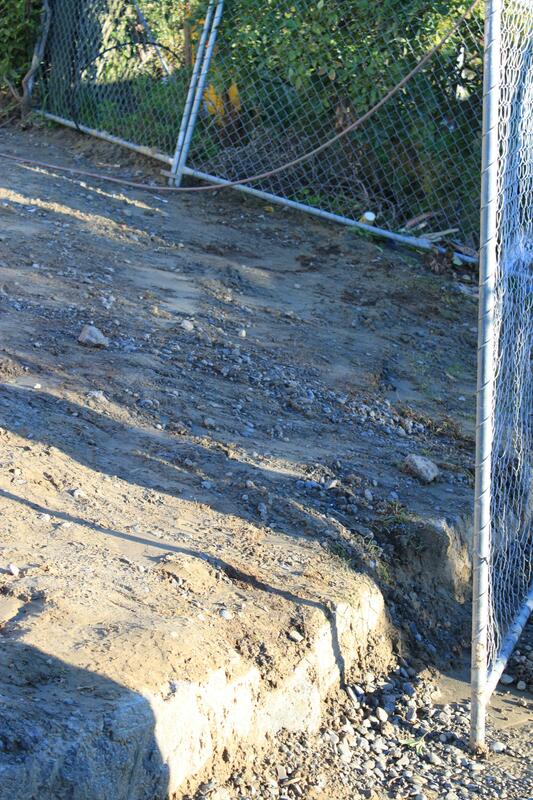 Rill erosion, in loess soil on a Lyttelton Harbour/Whakaraupō building site. 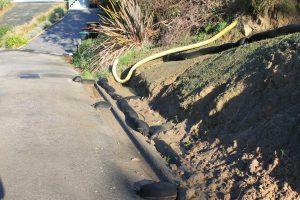 Gully erosion is the removal of soils along deep (>300mm) channels. Gullies are often distinguished from rills as being too large to step across. 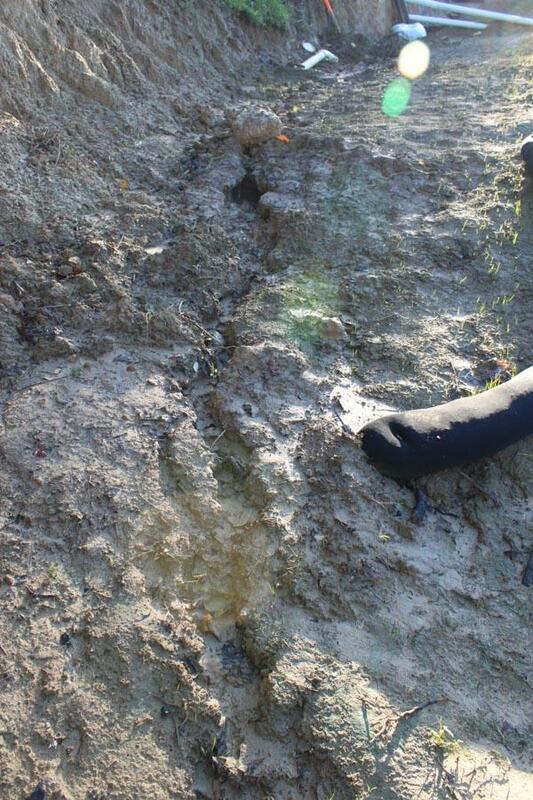 Gully erosion occurs when soil is removed by forceful concentrated flows that form channels. Slides or mass movement within the gully. 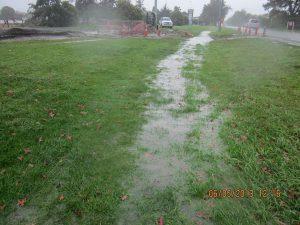 Gullies are very difficult to remediate and often require cut and fill earthworks. They may develop rapidly and develop a significant amount of erosion, particularly in loess and poorly compacted fill. 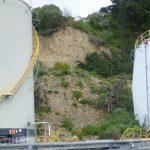 Gully erosion of loess soil, Lyttleton Harbour/Whakaraupō. Tunnel erosion refers to the formation of long cavities beneath the ground surface, whereby subsurface soil has been removed by surface water while the surface soil remains intact. Eventually tunnels reach a point where the roof collapses resulting in potholes and the formation of erosion gullies. 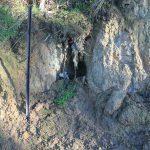 Small tunnel erosion in loess exposed by track excavation. Gullies formed by collapsing tunnel erosion. The erosion of stream channels results from the conveyance of concentrated flows with high velocities, which scour the channel boundaries. Channel erosion is a natural occurrence, but is significantly accelerated by increased runoff from urban development. This leads to eroding stream banks and larger channels. Channel erosion is a significant source of sediment within watercourses and estuaries, particularly those bounded by urban catchments. 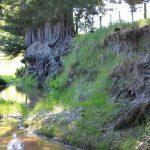 Channel erosion has resulted in this stream becoming deeply incised. 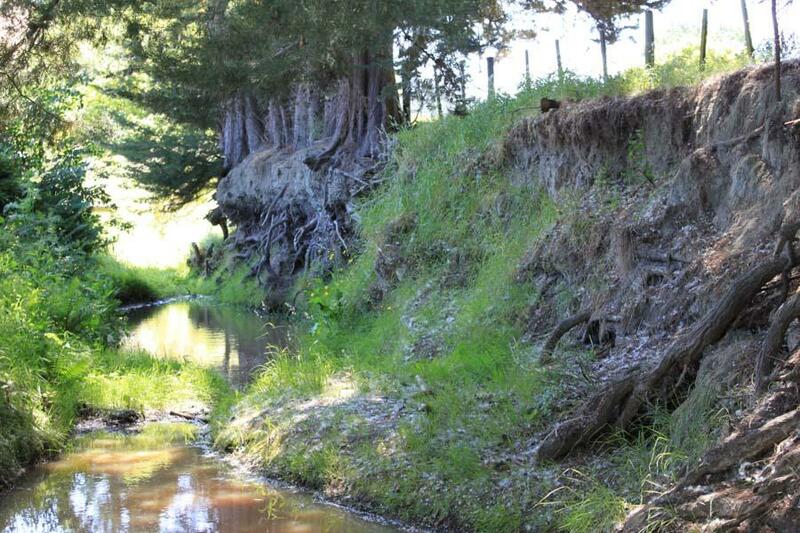 Channel erosion has resulted in this stream becoming deeply incised (Source: Eos Ecology Limited). Mass movement is the erosion of soil or rock by gravity-induced collapse. It is commonly initiated by groundwater pressure following heavy rain, but can also be caused by stream bank or earthworks undercutting at the base of a slope. Movement can both be rapid and near instantaneous (landslides, avalanches, debris flows) or slow and intermittent (earthflows and slumps). Mass movement is often noted following the removal of vegetation from critical slopes associated with land clearance. 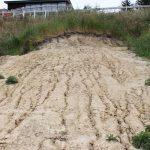 Mass movement can cause major problems on earthworks sites and lead to considerable sedimentation. Geotechnical investigations and design are required to avoid mass movement during and after construction. 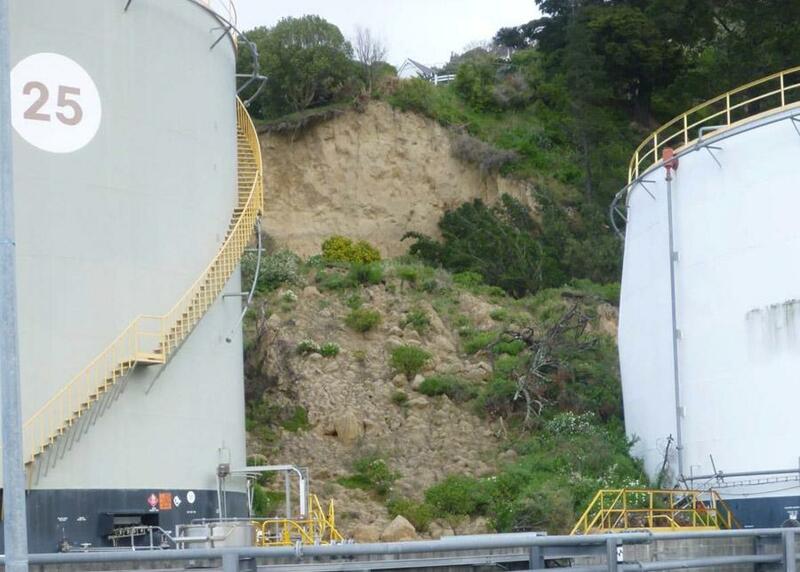 Mass movement erosion of soil, Lyttelton (Source: Eos Ecology Limited). Wind-blown sediments (dust) from earthworks sites and agriculture can be a significant form of air pollution. Stabilising exposed surfaces is the only long-term means of preventing wind erosion. 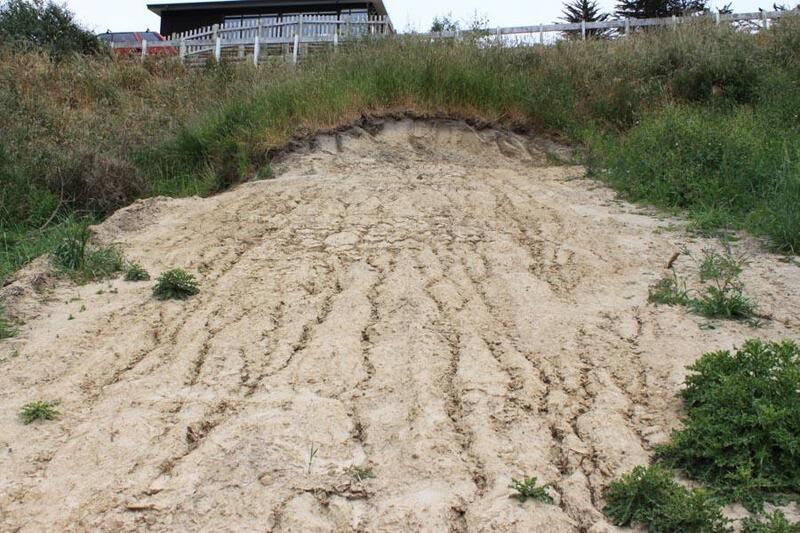 Severe wind erosion of Canterbury plains soil (Source: RST Solutions Limited). Consider these factors during your project’s planning and operations. Weather is an important factor to consider when planning and implementing earthworks. Rainfall and wind have the potential to initiate erosive processes and cause significant erosion and sedimentation issues. Rainfall intensity, duration and frequency are the main factors that determine the volume of runoff at most sites. The potential for soil particles to become detached and transported becomes greater as these factors increase. For the Canterbury plains and other flat areas of the region wind erosion during very strong winds will be the main erosive force. While potential erosion is likely to be more significant during higher rainfall months, erosive processes can occur at any time of the year. Best practice erosion control must still be followed through the year. High intensity rainfall or high wind events can result in significant erosion and can be experienced at any time of the year. 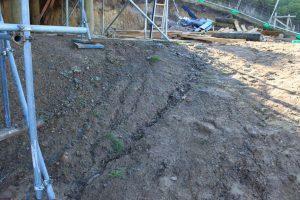 The length and angle of a slope significantly affects erosion potential. 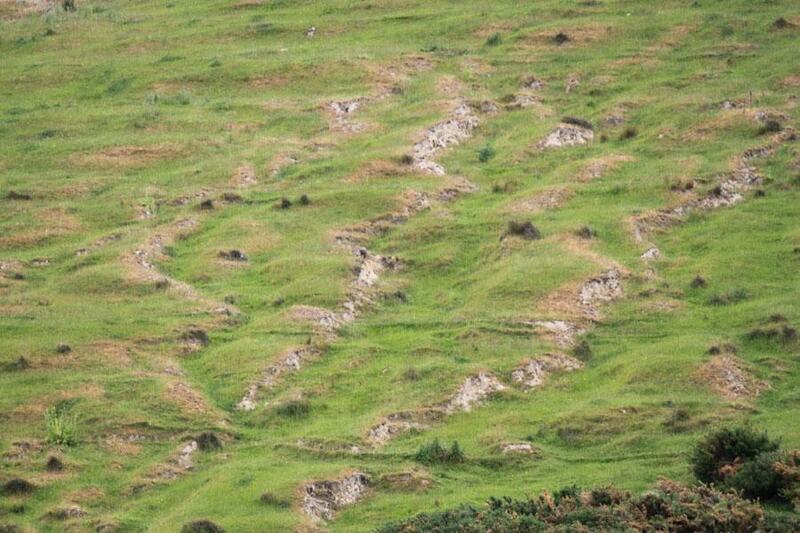 Avoid promoting erosion in disturbed areas by minimising the slope length, more so as gradient increases. Slope length and slope angle are critical factors in determining erosion potential because they have a significant role in determining the velocity of runoff. Increasing slope gradient increases potential flow velocity. Increasing slope length increases the catchment area of the slope and as a result increases the potential for flows to concentrate. This also will increase the volume and velocity of flows down the slope. As the slope of a site steepens and lengthens, the potential for soil erosion increases, particularly rill and gully erosion. As flows pass further down a slope, the potential for erosion increases. 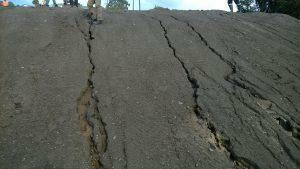 Therefore, the lower sections of slopes typically experience more significant erosion than the upper surfaces. Many Canterbury soils only have a thin organic matter layer. However thin, this does provide some protection to highly erodible subsoils. 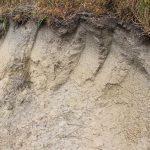 Soil erodibility is the susceptibility of soil particles to become detached by erosive forces. The soil characteristic explanation list shows soil characteristics that can reduce and enhance erodibility. Management of soils can make a big difference to actual erosion, even of highly erodible soils. For example, highly erodible soils that are well protected by vegetation may be subject to little erosion. Soil texture is the particle sizes that make up a particular soil and their relative proportions. The three major classes of soil particles are sand, silt and clay. Soils that contain higher proportions of fine sand and silts are considered more erodible. 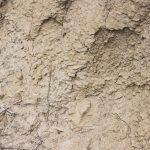 Erodibility decreases with clay content, as clay binds soil particles together. However, while clay is more resistant to erosion, once eroded, it is far more difficult to settle out and retain on site. Organic matter is the plant and animal litter component within soil. This is found within topsoil and can significantly reduce runoff and erosion potential as it often improves soil structure and increases permeability, water holding capacity and soil fertility. Soil structure is the arrangement of particles into aggregates, including the size, shape and distribution of pores within and between the aggregate. When soil is compacted, water tends to runoff rather than infiltrate, increasing the potential for erosion. Soil permeability is the ability of the soil to allow air and water to move through the soil. 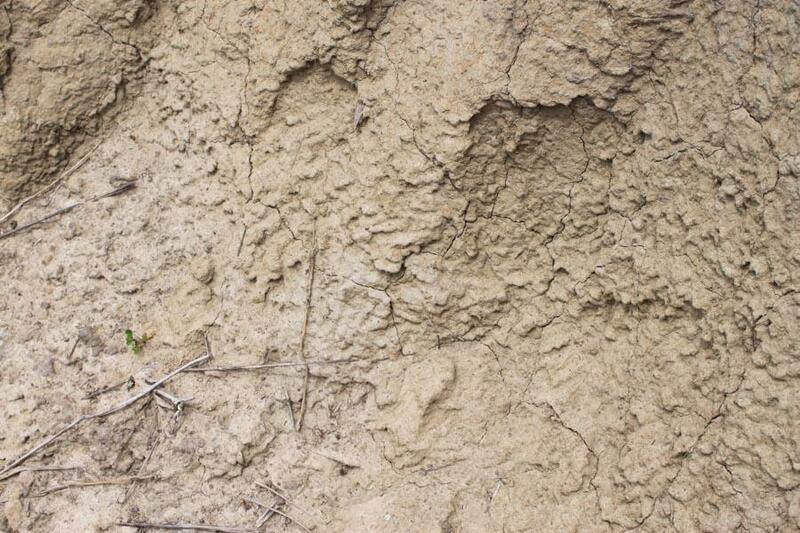 Soil porosity is the fraction of the total soil volume that is taken up by pore space. Soils of high porosity generate less runoff than soils with a low permeability. Organic matter and the associated biological activity in soils play an important role in maintaining porosity. During summer and other dry periods in Canterbury evaporation can lead to higher rates of wind erosion when soil moisture is low. In those conditions, soil particles are less bound by moisture and are more easily windborne, particularly when disturbed by construction vehicles or exposed by earthworks. Severe erosion of the exposed surface has occurred on this steep slope, in contrast with the surrounding vegetated land. Ground covers such as vegetation and impervious surfaces provide protection from erosive forces of raindrops, wind and flowing water. On a vegetated site, the potential for erosion is greatly reduced as the ground cover provides instant protection by reducing the impact of rainfall, dispersing flows, slowing down runoff and maintaining the soils ability to absorb water. The longer soils are uncovered and unprotected, the more rainstorms and wind events they will be exposed to, greatly increasing the opportunity for erosion. Also, there is a greater chance they will be exposed to large storms over time. 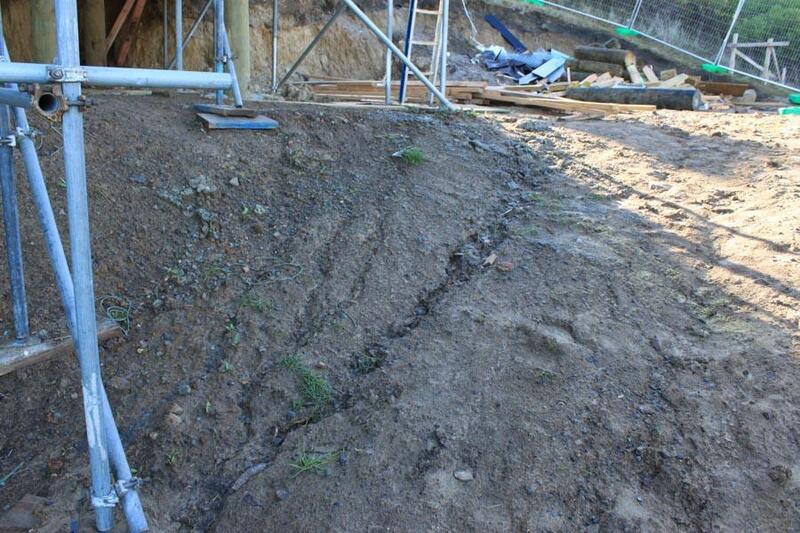 The soil on this building site was needlessly exposed for an extended period, resulting in considerable erosion. The longer that disturbed soil is exposed, the greater the chance that it will be subject to rainfall, strong winds, or for areas near waterways, high flows. Minimising the length of time that disturbed soils remain exposed is one of the keys to effective erosion control, to avoid strong winds, heavy rain or high waterway flows. 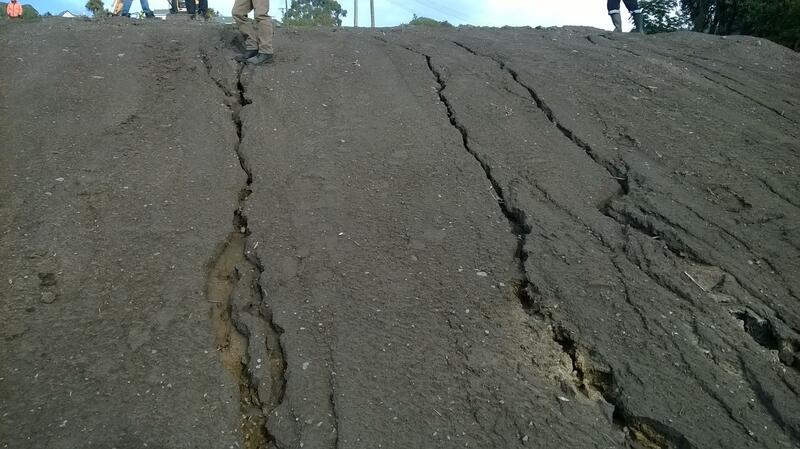 Rapidly stabilising exposed soil will reduce this risk. One way to minimise the length of time soil is exposed to erosive wind or water is by staging works. A balance is always required between the overall duration of earthworks and their staging. Sheet flow is the overland flow or downslope movement of water in a thin, continuous film over relatively smooth soil or rock surfaces and not concentrated into channels larger than rills. Sheet flow runoff from an earthworks site. Concentrated flows are where rivulets form on the surface over which the runoff travels. At this point sheet flows have become channelised into rills and cause accelerated erosion by cutting down into the soil surface. Tools for managing sheet flows are usually ineffective for concentrated flows. Using tools to prevent sheet flows converting into concentrated flows is effective and good practice. Usually this means ensuring that catchment length on slopes is minimised, with water diverted into well-formed and protected channels for treatment in sediment retention tools. A small concentrated flow channel that has developed after rain on a building site. Canterbury has a combination of dry conditions and very strong winds, making wind erosion of soil more likely here than in other parts of the country. Nor’westers are hot, sucking moisture from the ground. Also, their strong gusts often erode soil, causing dust. Southerly winds often follow the dry nor’wester. This sudden change frequently creates large dust clouds. Easterly winds are usually less strong than nor’westers and southerlies, but they are the most frequent, and affect dry exposed soil. Canterbury’s long windows of dry weather are perfect for getting earthworks done and exposed areas stabilised. But on the other hand, strong winds are common, so stabilising soils before the winds hit is essential to stop soil and dust blowing away. While Canterbury’s strong and gusty drying winds are most common in late spring and autumn, all parts of the region can experience severe, intense storms at any time of the year, so you need to have effective measures in place. Rainfall varies across the region. Average annual rainfall in Christchurch is around 650 mm, Timaru around 590 mm and in the Canterbury Plains it’s less than 1000 m. Mountainous areas receive metres of rain per year – for example, Arthur’s Pass gets more than 4m. 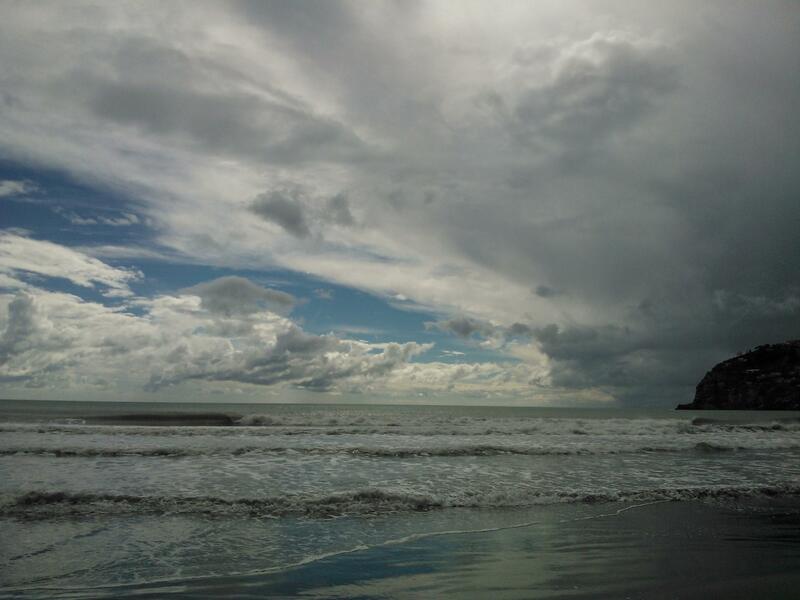 While parts of Canterbury are drier than much of the rest of New Zealand, intense rainstorms can hit at any time of the year. This will result in erosion of soil from unprotected areas and pollution of waterways. So, while it is often dry for extended periods, be prepared for bad weather by managing your site carefully and using the tools from this toolbox. Wind and weather patterns in Canterbury make us especially prone to dust problems. 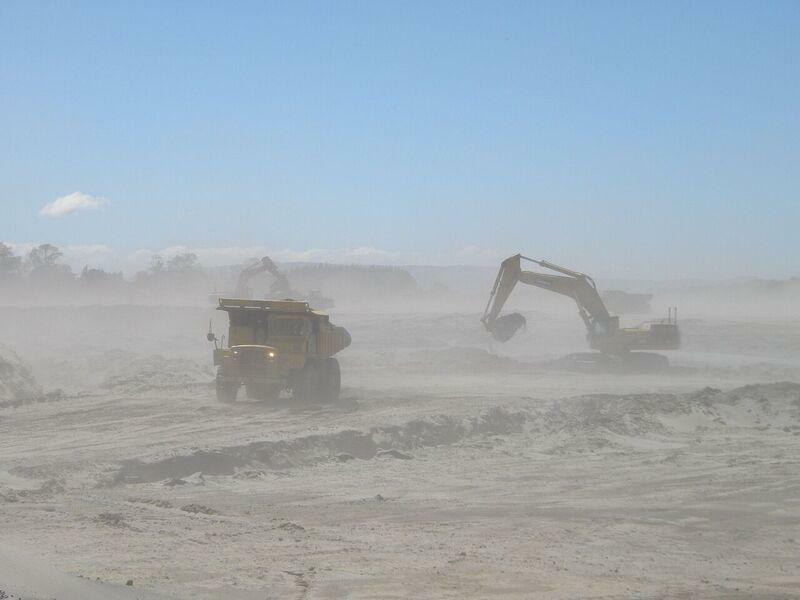 In addition, since the quakes we have had an increased number of roadworks and construction sites, creating more dust. Dust creates health hazards, traffic safety problems and off-site damage. The effects are not only unpleasant but can also be costly. There are costs to ACC and the health system following dust-related accidents, eg in traffic. Offensive dust can make it unhealthy or unpleasant for residents or workers downwind of a dust source. Dust getting into factories or production plants can require major investment to repair or redress the effects, with consequences for insurance. Wind erosion from earthworks—proactively manage dust risks to avoid discharges (Source: RST Solutions Limited). 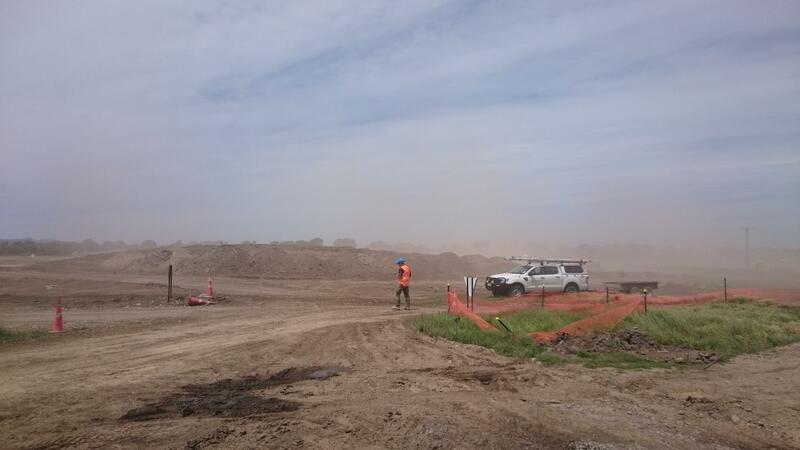 If your site has the potential to produce dust, you must take active steps to minimise and control wind erosion. Offensive effects can be avoided by good dust control at source. Poor dust management can mean that you may be civilly liable for the mitigation or repair of effects and criminally liable for penalties imposed by Environment Canterbury. 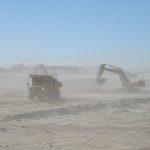 Prepare and implement an effective dust management plan for your site. Make sure that everyone on site understands the need to minimise dust discharges and the actions required of them in the dust management plan. For more information, see the section in this toolbox on Dust control. Prosecute for the most significant breaches or failures to heed warnings. Canterbury has a diverse range of soils. Use the map and following information to define the broad land type in which your development is located. This will help you start to work out risks and develop options for erosion and sediment control for your project. The map is indicative only and a site-specific assessment must be undertaken to confirm land type. If it is not clear which soil type applies, contact Environment Canterbury for more detailed maps or advice. 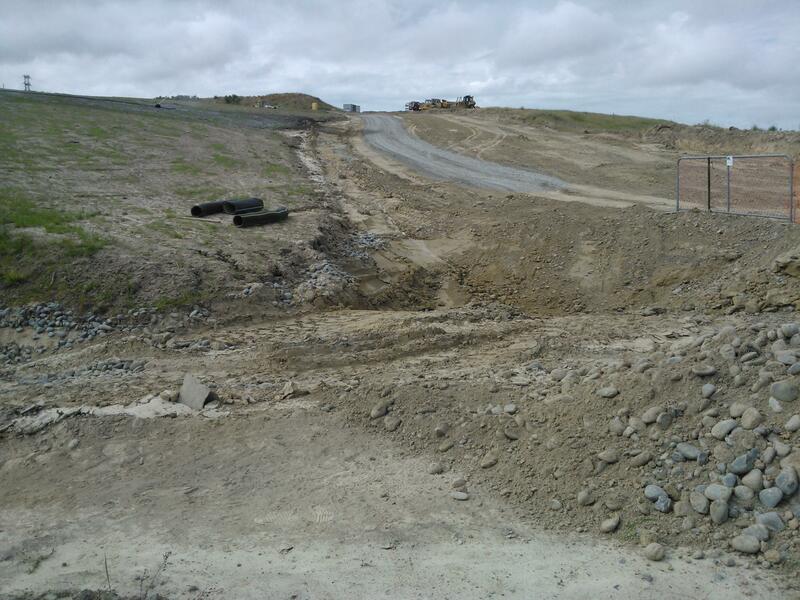 Environment Canterbury takes a precautionary approach when assessing land types for the purposes of developing earthworks erosion and sediment control plans. General distribution of Canterbury soil types. Canterbury Plains soils with good infiltration and low water table—can be subject to intense wind erosion when exposed. Recent floodplains from alpine-sourced braided rivers and foothill rivers with 600–1000 millimetres/year rainfall, on active riverbeds and associated floodplains, low terraces and marginal wetlands, on active river gravels and recent alluvial soils. Difficulty of revegetation in times of summer heat and drought and winter cold. On this flat land it can be difficult to obtain enough gradient for some erosion and sediment control practices to be used effectively. For example, sediment retention ponds and the drains directing runoff to them may need too much excavation for the required storage volumes and gradient. However, there are areas of high infiltration into the underlying alluvial gravels. 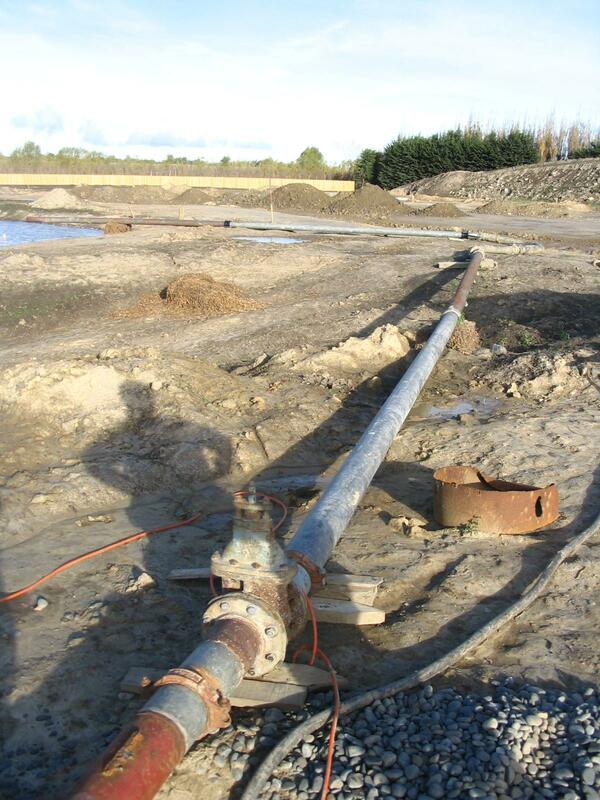 Onsite soakage of clean and dirty water may be practical in alluvial and/or loess deposits over gravels that form silt loams, stony silt loams, fine sandy loams or stony fine sandy loams in parts of the Canterbury Plains and other flat lands such as parts of the Amuri basin and some intermontane basins. 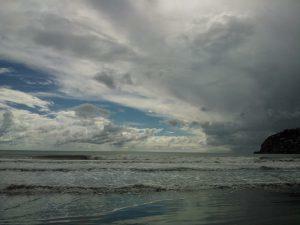 Some areas close to the coast may experience groundwater inflow. The map is only indicative. Check whether your site has permeable soils that allow infiltration, or whether there are risks of groundwater interception during earthworks. If there are springs in the area, then there is a good chance that any earthworks may intercept groundwater. On flat land like this, controlling run-on water, if necessary, may be done by use of clean water diversion bund or other equivalent tools. Consider directing the run-on water to a clean water infiltration system. Sediment may be prevented from leaving the site by using retention tools or infiltration into the ground, ensuring separate facilities for any infiltration of clean and dirty water, and a stabilised site exit point. a stabilised site exit point and control of sediment from high traffic areas. This is not an exhaustive list, so ensure that you pick the tools that will be effective in your situation. Land near Lincoln with groundwater close to the surface and springs—infiltration is poor. Wetlands, valley floors and terrace moraines in the inland river basins and major river valleys, with rainfall of seven hundred to 1000 millimetres/year, with gley and organic soils. For these and other areas of poorly drained, fine, gley and clay soils with low rates of infiltration and high levels of runoff, lack of gradient may make the use of some erosion and sediment control practices challenging. The lack of infiltration availability makes it essential to protect waterways by reducing erosion and sediment concentrations before discharge into adjacent drains and surface water bodies. Plan sediment control tools carefully. Getting dirty water to sediment retention ponds may present practical challenges on this very flat land, but they will be needed to minimise sediment discharge to receiving environments. This is especially the case if other sediment control practices will not adequately control sediment. Minimising the amount of dirty water needing treatment by always effective erosion control will reduce the size of the sediment control measures required. 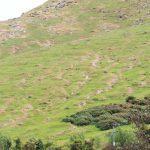 Banks Peninsula and Port Hills soils are often extremely prone to erosion when disturbed. Much of this land is very steep, increasing the risk of erosion and sediment runoff. The steeper the slope, the more care is needed to address this risk. There is particular focus here on Banks Peninsula and the Kaikoura coastal zone, but the general risk management approach applies to all sloping land. Some soils in these areas are easily mobilised when disturbed or exposed, with soils on soft rock and loess-mantled hill slopes being inherently weakly structured and at risk of large-scale erosion, including slope failure. 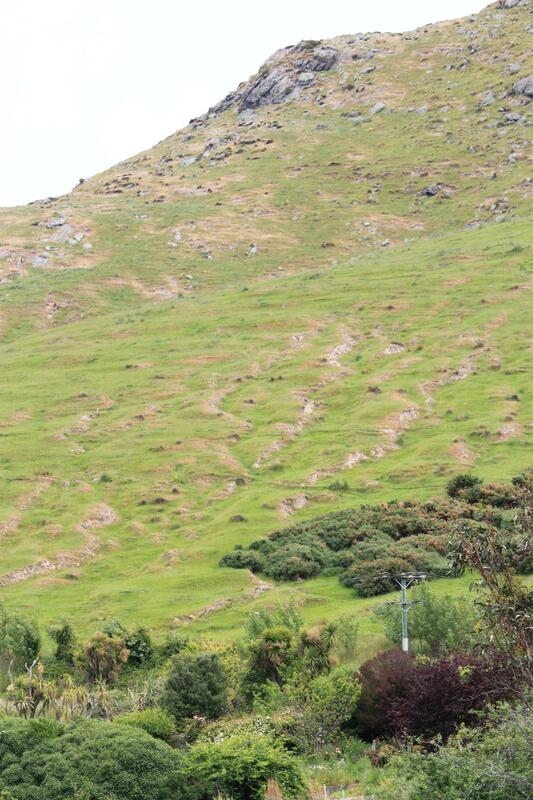 Areas undergoing development on these erosion-prone soils include Banks Peninsula/Port Hills, some loess-covered hills in North and South Canterbury, and steep lands with other soil types developed on softer rocks. Rainfall is 1000–1400 millimetres per year on the summits of Banks Peninsula, with occasional snow. The lower slopes receive 600–1000 millimetres/year, and are drained by short, steep streams, some spring-fed and with very severe summer low flows, rendering them more vulnerable at this time to sediment inputs because of the lack of transport velocity in the stream. 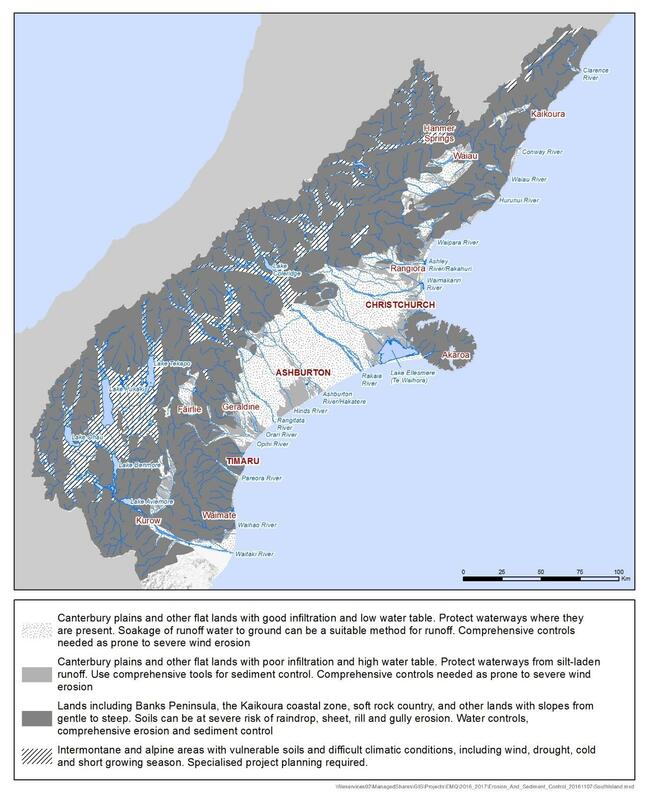 In these areas, especially on steep slopes and in the unstructured loess soils of Banks Peninsula, there is a high erosion risk and very careful water management is needed. Massive gullying has been noted in loess soils undergoing urban development, such as those in Westmorland on the Port Hills in the 1970s. Sediment retention ponds need careful design and siting, to avoid the risk of failure from the mass of impounded water on land over steep slopes. 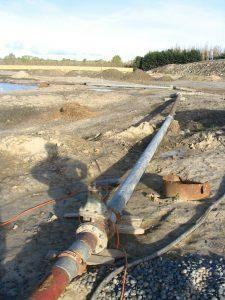 Seek assistance from suitably qualified and experienced geotechnical experts. Flocculation is usually required to achieve acceptable water quality. Care is needed when locating, constructing and maintaining the erosion prevention measures for control of run-on water, separation of clean from dirty water, outfall protection and protection of the land surface from erosion. 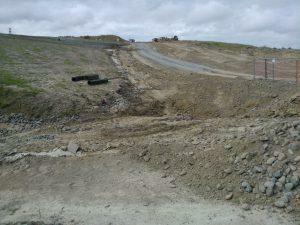 Choosing methods of erosion control that reduce risks is very important in these areas. Erosion and sediment control practices that concentrate water flows, or unstabilised channels and outfalls, will cause erosion and slope failure, so it is imperative to use the methods in this toolbox. Concentrated flows can also cause tunnels to form along channels. It is important to keep channels shallow to avoid getting into the subsoil, and armour. Long-term perimeter and mid-slope diversion systems need to be monitored weekly and before and after rain for holes in the ground that may indicate that tunnels are beginning to form, so that they can be promptly sealed off and filled in. You will need to consider using the full range of erosion control measures on these soils to effectively minimise erosion. Putting effort into erosion control will make achieving effective sediment control and water quality results considerably easier. Coastal soft rock country: strongly rolling to steep, dissected lands with rainfall of 800–1500 millimetres per year and yellow-grey to yellow-brown earths and some limestone-derived soils. Aggradational fans, rolling to undulating lands with recent soils to 160 metres above sea level with wetland fringes. Rainfall 700–1300 millimetres per year and there are spring-fed streams and a shallow unconfined aquifer. Wind, sheet and rill erosion on the aggradational fans. more stable landforms with 600–900 millimetres per year rainfall and mainly rendzina soils. Wind erosion on the limestone lands. Other land with gradient includes hard rock hill country – for example, steep erosional hill slopes, crests and summits on greywacke, generally below 1000 metres above sea level. Rainfall is 600–1200 millimetres per year on yellow-grey to yellow-brown steepland soils, and the streams are small and subject to pronounced seasonal low flows. Difficulty of revegetation in winter (cold), in summer (low moisture) and on thin, infertile soils. 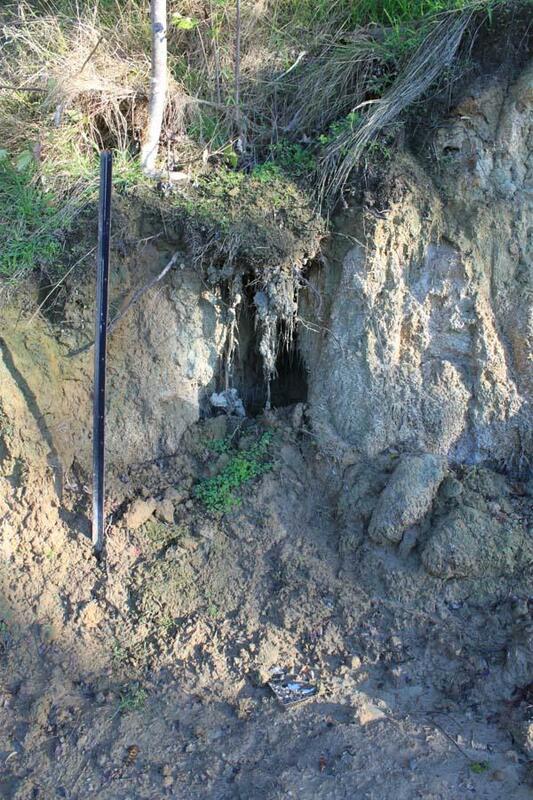 Some clay soils are found on areas of moderate slopes within the Kaikoura coastal zone, soft rock hill country and downs, generally around coastal Cheviot and Timaru areas. Clays are difficult to remove from runoff as the particles have a negative electrostatic charge that prevents them from readily settling out. Use flocculation to enhance sediment retention of clay soils (see coagulation and flocculation section). Effective control of run-on water and the other erosion control measures are needed to minimise the detachment of fine clay particles. Together with separation of clean from dirty water, this will also minimise the volume of dirty water needing treatment. Alpine and intermontane areas have vulnerable soils. including floodplains, wetlands, valley floors and terrace moraines, intermediate terraces, high terraces and moraines and fans. Rainfall varies from 700–1000 millimetres per year in the floodplains and wetlands to 500–800 millimetres per year in the fans and high terraces. The inland river basins and major river valleys have gley and organic soils; the high terraces and moraines have quite deep, yellow-brown earths, and the floodplains, intermediate terraces and fans have shallow stony soils. Difficulty of revegetation in winter (cold), in summer (low moisture), with strong winds and on thin, infertile soils. Lands above 900 metres above sea level have harsh climates that limit the establishment or recovery of vegetation cover. Erosion and sediment control practices will need to specifically minimise wind erosion as well as these climatic challenges, including making sure that any over-winter practices are resistant to damage by freeze-thaw processes. Effective use of geotextiles is likely to be beneficial in these areas. Where fine soils are present, it may be difficult to remove them from site runoff with standard sediment control measures, so primarily focus on preventing erosion. 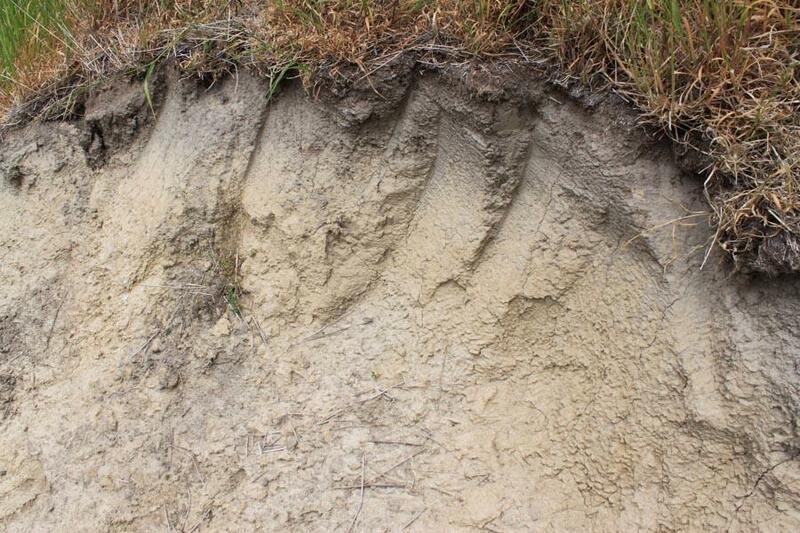 Loess is a highly erodible soil, and there are deposits of it throughout New Zealand. The Marlborough-Canterbury deposits came from Southern Alps/Kā Tiritiri o te Moana greywacke which was ground to fine particles by glacial action. Being light and friable (which means, easily crumbled), it was blown from the Plains and deposited on Banks Peninsula, remaining unconsolidated. 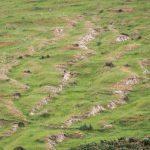 It is the main basis of soil on Banks Peninsula’s lower slopes and ridges. In EOS Ecology’s 2016 research [pg 52], bare loess plots had an average total sediment yield of 3,726 g/m² during a simulated one-hour, 29 mm/hr rainfall event on a 1:5 horizontal to vertical slope. We can see from these results that loess soils exposed by earthworks or disturbance are extremely prone to erosion. Fortunately, we have the tools and techniques to minimise soil erosion and capture sediment, if best practice is used as per this toolbox. The lower slopes of the Port Hills are popular for residential development. Accelerated construction activities after the quakes, both demolition and rebuilding, have placed increased pressure on waterways draining the Port Hills. During wet weather, significant quantities of clay and fine silt particles enter waterways and stay in suspension, affecting downstream water quality and aquatic ecology. 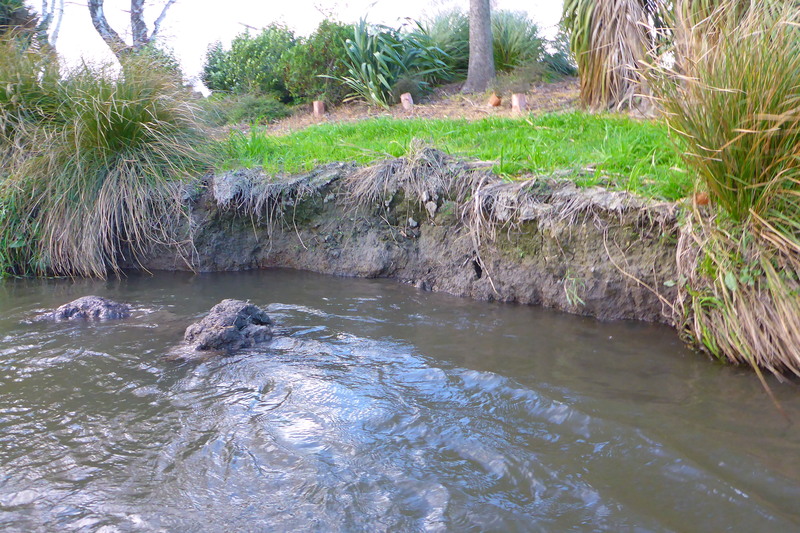 Suspended sediment discharges into the Cashmere Stream, and on through to the Heathcote River/Ōpāwaho and Estuary of the Heathcote and Avon Rivers/Ihutai. Loess typically has three layers: the surface (S-layer), the compact or hardpan layer (C-layer) and the parent material (P-layer). The deeper you dig, the more prone the soil is to erosion. This change is marked by a change in colour from brown to yellow, with yellow being the highest producer of sediment. A typical cut soil profile from the Takahe series soils, occurring from sea level to the lower slopes of the Port Hills (Source: Eos Ecology Limited). Severely eroding loess, Port Hills. Note how erosion affects the P-layer more severely. Sheet wash at the top of the slope rapidly transitions to rilling on the lower half. (Source: Eos Ecology Limited). Loess is prone to dispersion – which means that its chemical and physical properties allow it to be easily suspended and washed away. Dispersive soils quickly create a cloud suspension of fine clay and silt particles, which have a higher percentage of sodium than other soils. Chemical forces in sodic soils stop the suspension from settling. These processes result in soil rilling, gully and tunnel gully erosion and water quality problems. Slake test. Local loess is in the ‘severe’ category. 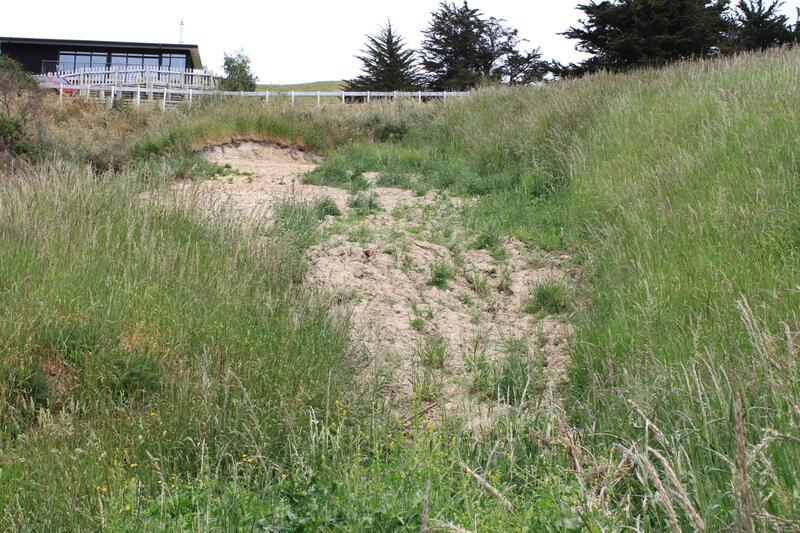 Selecting an appropriate treatment to protect exposed loess depends on many factors, including the stage of disturbance, the slope, the application scale, site access, complexity of exposure, and whether the treatment is for short- or long-term. Usually you will need to mix and match tools from across this toolbox throughout the phases from initial site disturbance to final site stabilisation. All subsoil disturbance (ie, cuts >0.3 m deep), independent of site scale, should have an ESC plan which states the method to be used at each stage of the project. The most important stage for preventing loess erosion is when the subsoil is first exposed during clearing, re-contouring and infrastructure/dwelling construction. Erosion control right from the start is the main defence against surface runoff. This is important even for small sites. Coverage is the quickest defence. This can be by compost and/or vegetated topsoil. Use temporary measures such as copolymer to give you time to establish permanent cover. Compost is a very effective means to promote soil stabilisation in general. It retains rain water much more effectively than loess and topsoil, and often has an electrical charge that attracts negatively charged soil particles and is a very effective bed for seed strike and establishing vegetation. It works best when laid more than 5 cm deep. Even before vegetation has established, the compost bed is extremely effective at protecting erodible soils below it. For more information, see the compost and grassing section of this site. Topsoil is not normally recommended as an effective stabilisation tool on its own (until the vegetation seeding has established), but research shows that on highly erodible loess soils it can still be a very useful temporary measure, achieving an almost 90% reduction rate. It absorbs rain better than loess does, and so reduces the erosion potential and sediment runoff. Over loess, it should be applied 10 cm deep. Using topsoil along with revegetation to cover exposed loess and other subsoils will minimise erosion. For more information, see the top soil and grassing section of this site. Even when you apply all erosion control tools accurately to loess, there will still be dispersed sediment at unacceptable levels. You need to have downslope treatment devices that are effective and at the appropriate scale for loess soils. Because of its properties, loess is not easily retained in the sediment retention devices commonly used on construction sites, such as detention basins. Tools available to you include chemical treatment (flocculation) to enhance the performance of decanting earth bunds and sediment retention ponds — but only if these are appropriately sized. For loess sites, pond sizing (volume) should be 30% larger than the calculated 10 hour, 20% AEP rainfall event.